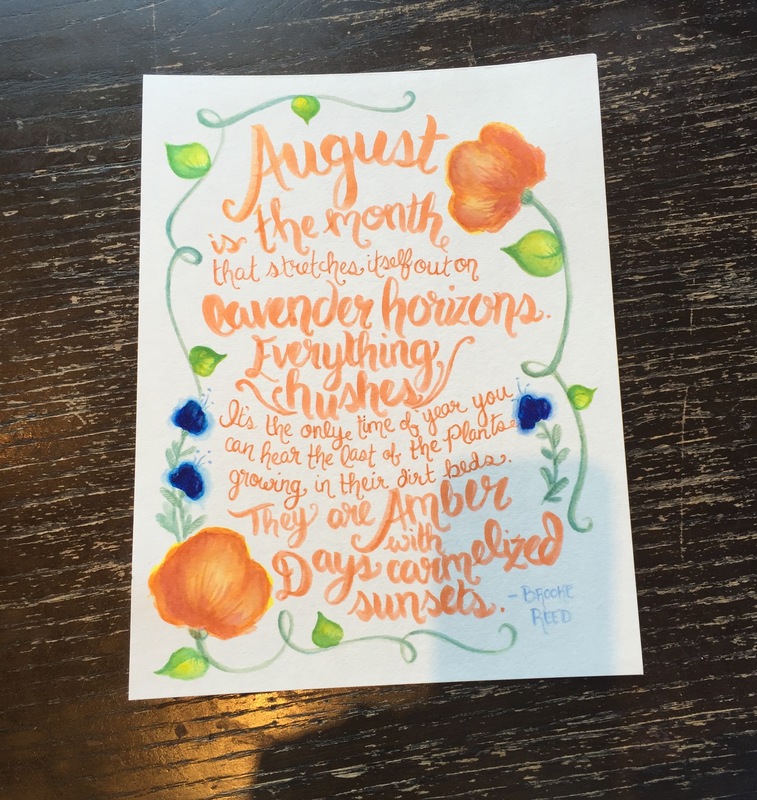 If you’ve read any of my blog, you may have realized that August- along with February- feel like the most obligatory and annoying months of the year to me. February because of its mix of tundra and wonderland-turned-evil-sludge-that-ruins-everything, and August because of previously outlined reasons found here. But I have endeavored to like August for the past couple of years, because of reasons found here. So, in spite of the persisting uncomfortable humidity, bugs, and general upheaval that comes with beginning a new school year (although a girl at Charlotte Russe totally thought my mom was taking me back to school shopping the other day. I was like, “You’re adorable.”) I have decided that this month will be an opportunity. An opportunity to hush my house and myself before the festooning of fall begins. Once you decorate for fall, it sort of marks the beginning of some of the most beautiful and festive months of the year. And also, for good or ill, some of the most rushed. (Is it ironic to anyone else that “rushed” and “hushed” rhyme???) And while I usually decorate way earlier than most people anyway, it’s because I just want to savor autumn well, especially since it often feels devoured prematurely by Christmas (another season for which I bear no small amount of enthusiasm). Hushing the house is something The Nester talked about earlier this summer. Of course, she highlighted the concept to mirror the nature of summer, to quiet your home and quiet your life a little as you take a break from the busy rest of the year (even if you still work full time, etc). It is another way to de-clutter, which is also one of my words on my banner for 2015 (which you can see at the top of the page). So, this is how August is redeeming itself for me. “Everything hushes.” That’s sounds nice, doesn’t it? For me this year, fall will mark the beginning of a particularly exciting and challenging season- but you’ll have to stay tuned to find out why! Lots of developments of the blog-rific and artistic nature- I’m SO excited I wish I could just tell you everything right this second! …. But that would kind of ruin the whole “hushing” thing. I hope you’ll take a leaf out of Brooke’s book, and “hush” along with the rest of creation in August. May all your Augusts be carmelized! How are YOU hushing in August? UPDATE: Here is the photo of the listing on my etsy shop, Ebenezer Designs! Next > Long Live Beauty's 50th Post! Hooray for the hushes (see said quietly)! Love you dearly!